We’re excited to announce dsSearchAgent version 3.3, the latest release of our mapping IDX service! dsSearchAgent v3.3 adds new search options to the Google Maps interface, new listing filters to our admin, and new calls to action help you capture more leads with your IDX. As part of our commitment to innovation, this IDX update is included for both new and existing dsSearchAgent Pro users. Additionally, all v3.3 features are now included as part of our free IDX trial accounts, so even those still on the fence about our solutions can take our latest features out for a spin. Read below to learn how the latest advances in property search technology are being used to improve the MLS search experience for your clients in this release. Now website IDX visitors can use our new Radius Search panel to find homes near a given location, just like they can on your mobile IDX. Home buyers simply use the built-in Use my browser’s location option or type in an exact street address, then specify the distance from that spot they want included in their search. This new search panel is available for all accounts and can be enabled from the Search Tab of your IDX Options. Added by popular demand, you now can create custom search links using polygon map areas. Custom IDX links make it easy to pre-filter listings on your real estate web site, and this new polygon option provides even more control over your search. You’ll find the new Custom Polygon editor in the custom Links area of your IDX admin. Zoom and pan the map around, then switch to our Draw a shape tool and outline the area(s) to include in your search. 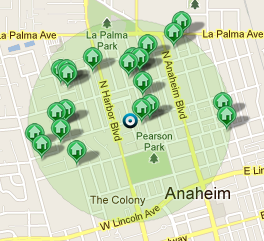 Polygons are great for filtering for listings near light rail stations, along the waterfront, or even on specific islands – – simply draw your search area! We’ve also added one-click access to driving directions on all IDX listings. Located under the Maps tab of each listing, our new Get Directions button prompts users for their starting location, then provides step-by-step directions to the listing using Google Maps data. 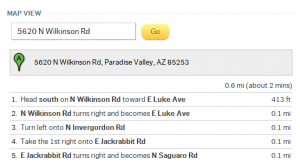 The Driving Directions option is automatically enabled for all accounts already using the Map features on their listings. You can edit these settings on the Details Tab of your IDX Options. Both our Radius Search and new Driving Direction features use a combination of Wi-Fi hot spots and IP addresses from Google’s mapping API to determine location for each IDX visitor. This data tends to be pretty accurate, but we also provide users the option to manually enter a starting address for their search. v3.3 adds new ways to convert your visitors and capture new leads with your mapping IDX. 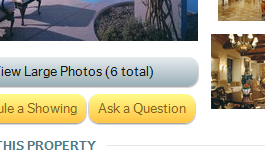 A new Ask a Question button makes it easier than ever for home buyers to get in touch with you. Located below the photos section on each IDX listing, this button prompts users to fill out a quick contact form at any time during their search. The Ask a Question button can be enabled through the Details Tab tab of your IDX Options. Additionally, we’ve added new instant message opportunities throughout the mapping IDX interface with new chat buttons below the contact form on the left side of all listings and below the Schedule a Showing and Ask a Question forms. All chat features send instant messages to your desktop or your mobile phone via SMS, and our new buttons make it even easier for buyers to take advantage of these features. Known in the real estate technology industry for our regular product updates and attention to customer input, this is just a first of many IDX updates for 2012. We encourage your feedback on this release as well as input on what you’d like to see in our future IDX releases! I was really disappointed when I found out that the polygon is not visible to the visitor! This could have been a great informative tool for home buyers to learn the boundaries of the various local neighborhoods! I can see that there may be some applications where agents may not want the polygon to be visible, so how about a checkbox that we could select in the link builder to “make polygon visible to visitors”? Please!?!? Sounds good to me! I’ll see if we can get this in the next release or another mini-release sooner than that.